First released in 1955 on 10″ Blue Note, and subsequently re-released on 12″ LP in 1957 with additional tracks and new artwork, on Lexington . This is a copy of the latter version, as reissued in Japan. The line up is magnificent, with one of my favourite bassists Oscar Pettiford, plus JJ Johnson, Hank Mobley, Cecil Payne and Horace Silver, though if I were Charlie Valdez I wouldn’t be too delighted with the nickname “potato”. Skin or shape, it doesn’t flatter. Blakey powers along as you might expect, no surprises there. 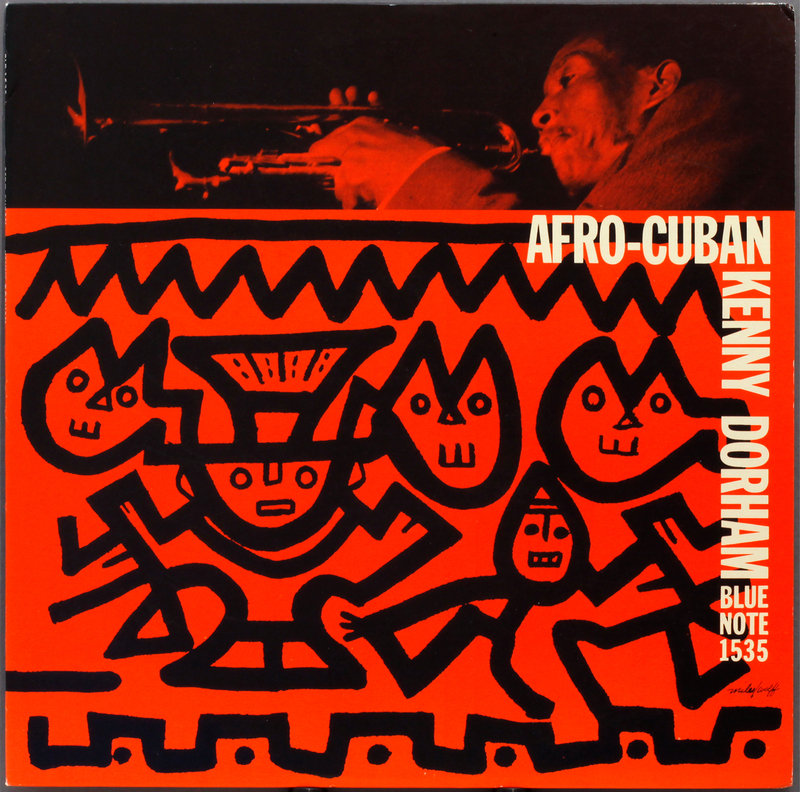 Dorham is in his best peppy form ,with his trademark rapid bursts of notes in twisting trails . Mobley excels in his generous solo space and Cecil Payne’s baritone adds some welcome texture, whilst adding a little JJ can never be wrong. As the title implies it’s a riproaring latin-infused bop session – time to brush up your steps to the Mambo, or may be just light up that Cuban cigar. “Hey Muchachos, Vaya con Dios!” I think I remember that from a Spaghetti western, it sounded sort of Latino. Japanese pressing by Toshiba-EMI dating from November 1983, nearly thirty years old itself, though reissued twenty years after the original Blue Note release on Lexington labels. 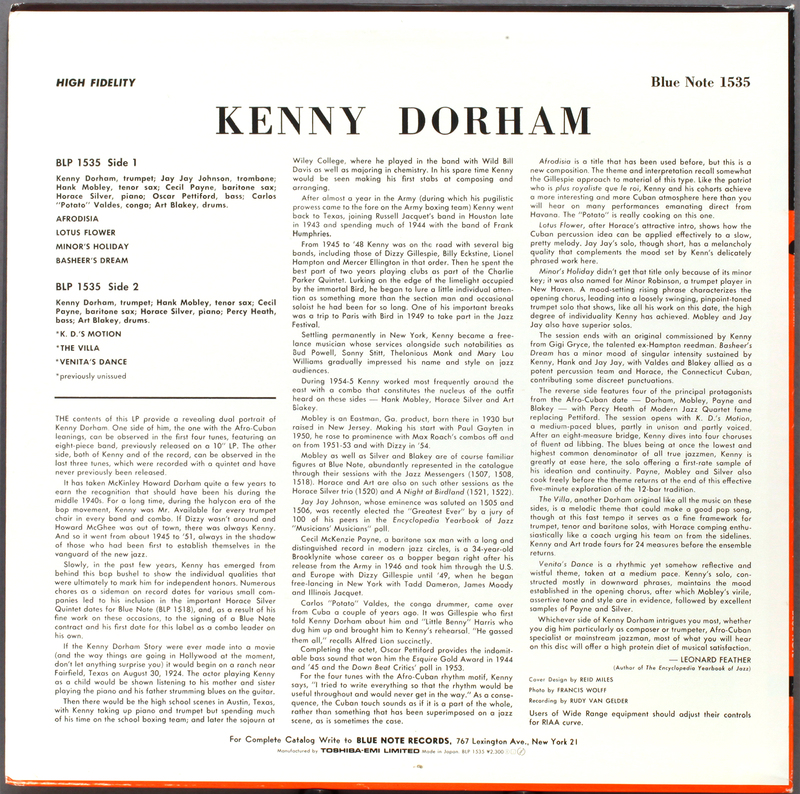 It may be considered one of Dorham’s best recordings as regards musical content, but as an audio recording it leaves something to be desired. 1955 was a little early in the way of recording technology, especially microphones, and it does sometimes sound a little boxed in, and occasionally the mikes overload. 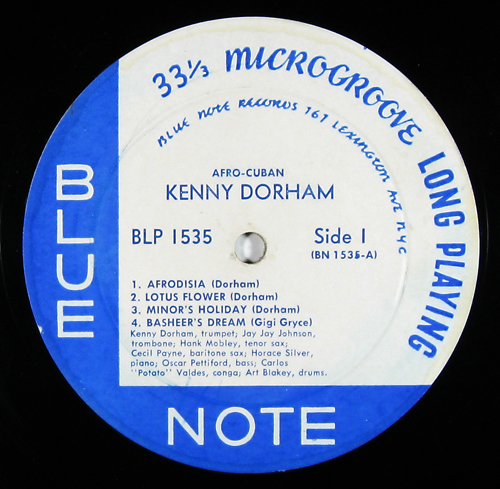 Kenny Dorham’s Afro-Cuban’s record came up, on Lexington!! Next up, the thirty-day trading summary of the “lucky” winner. Phew! Score over 1,000, makes thirty eBay bids a day, all on records, and he likes to chase the action, putting in up to six bids on the same item. He doesn’t like losing. If they were all big-ticket items like this one, he would be spending up to $100k a month on records. I can remember putting in three bids overnight and woke up terrified I had won them all. That evening I sat back and played my Japanese copy of Afro-Cuban. It’s very good. The Toshiba sounds great, but I can imagine it firing up as a 1st pressing on Lexington, fizzling with excitement. Dorham’s bright trail of notes, Mobley in your living room, tenor and baritone duelling, that would be very very exciting. I couldn’t have paid $1,300 for it, but the auction prompted me to hear the record afresh. I hadn’t played this for a long time. It was one of my first jazz purchases three years ago, which cost me all of £18. Hearing it now, I can now appreciate it in a way I couldn’t have as a jazz-rookie. So a good outcome. I hope the buyer gets as much pleasure from listening to it as I have, hopefully $1,250 more. Now, where’s that cigar? 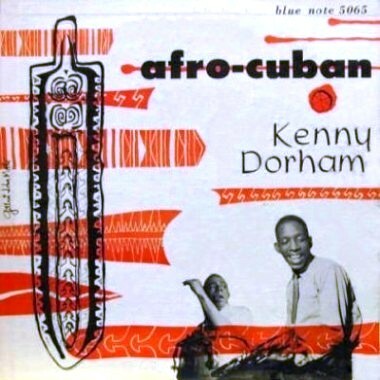 This entry was posted in Blue Note, Kenny Dorham and tagged Art Blakey, Blue Note, Cecil Payne, Hank Mobley, Horace Silver, Kenney Dorham, percy heath by LondonJazzCollector. Bookmark the permalink. In Spanish, potato is patata. Patato is Patato. LJC says: sure, ok, does this add anything to the discussion? I just Picked up Trompeta Toccata after a very long search. Liberty Stereo Vangelder stamp, And I think its the most dynamic Liberty Pressing I have to date. Holy Moly did it blow my socks away!! The pressing is nothing out of the Ordinary. It does have a 114 in the deadwax. I can’t imagine it being better. Completely in awe with this pressing and extremely satisfied. Fantastic Post, I would love to hear that 10″. I have a Lexington, pretty beat up though. still sounds better than the CD. I just love “K.D.’s Motion”, quintessential hard bop, and underrated gem for sure! Now that’s a great link. Too bad however that nobody in that thread can 100% conclusively confirm the story though… But, as you can see and read: we’re not that far away from the actual truth behind the Japanese reissues! One extra remark though: in the thread above they talk about 2nd generation masters made from the actual masters, but that’s incorrect. If you put the actual master tape from the Blue Note vault on one reel to reel machine and copy it to a blank tape on another, then that copy is the 1st generation master tape. And I think that’s what the ‘Japs’ have. Because a 2nd generation master is a tape, pulled off a 1st generation copy, which would mean even worse sound, since it’s a copy of copy, you see? The guy in the above thread must mistakenly assume that the actual master is the 1st generation and therefore talks about 2nd gen. masters. Still it’s weird to know that it’s apparently possible to press perfect sounding LPs from 1st generation masters, don’t you think? I hear you. 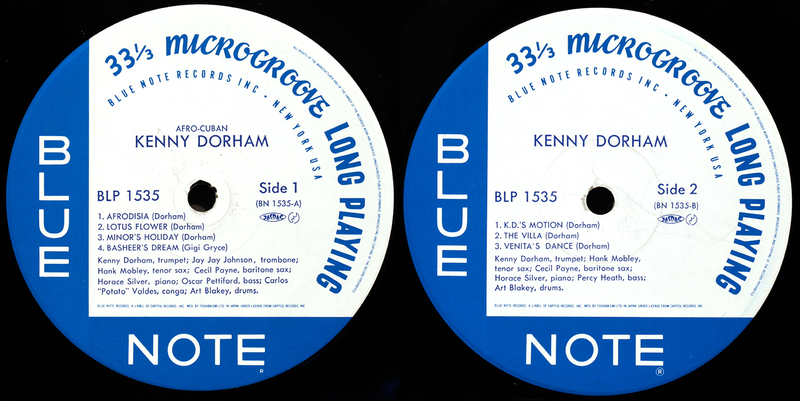 Having quite a few copies of Blue Note releases in both original Plastylite and King/Toshiba pressings, there are big differences in how they sound, which I think can not be put down to just pressing. There is another Master Race out there. Someone knows, and they are not telling. 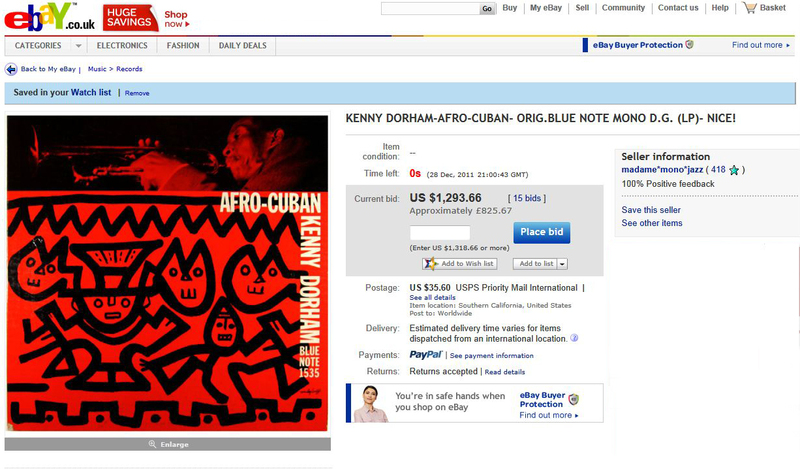 So, it is suggested a Blue Note parallel universe exists in Japan. Women. And if you cover up the cigar smoke with scented air freshener, she’ll demand to know what’s HER name. Women indeed. Damn, I’ve mislaid my cigar cutter. Would you mind…?